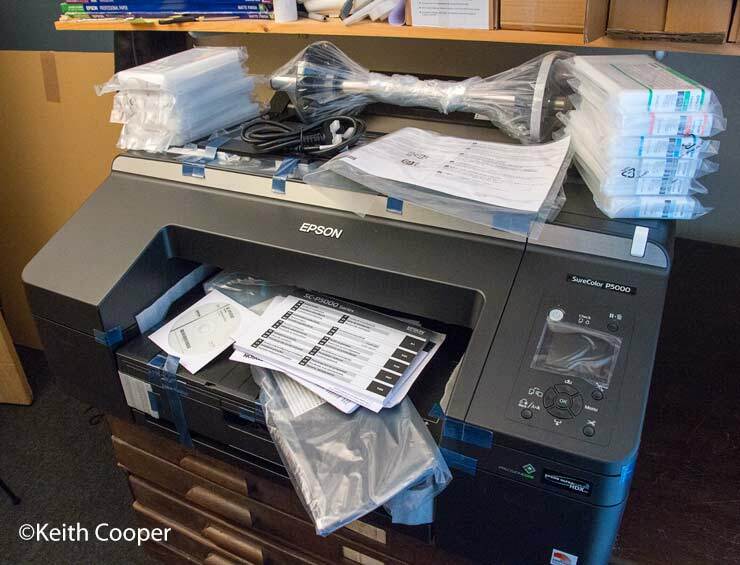 We’ve been testing Epson’s P5000 17″ A2 printer, both for Keith’s detailed review and subsequent paper and print related articles. The printer has worked flawlessly for some time, with excellent results and minimal needs for any additional head cleaning. 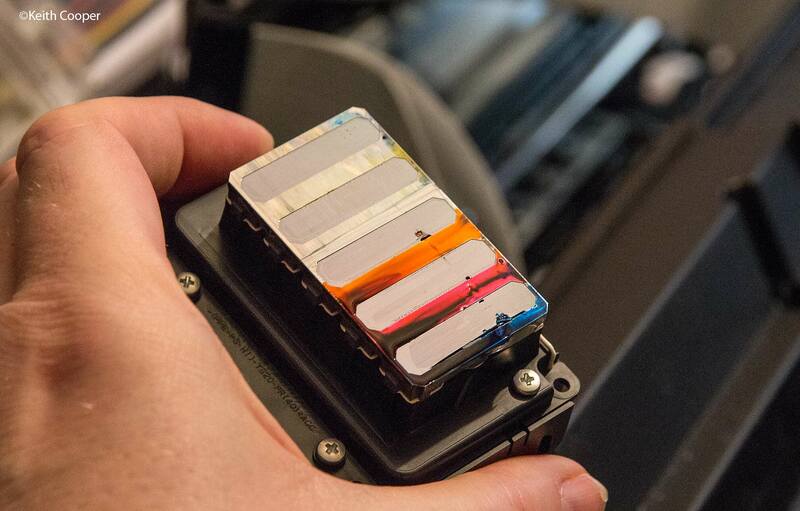 After some unexpected damage, Keith got to see rather more of the printer than usual and spent a very interesting few hours chatting about printers with one of Epson’s service experts. The other day, when feeding paper into the P5000, it made an odd noise and left a slight mark on the paper. A failed nozzle check and a few cleanings showed three ink channels just not printing at all. 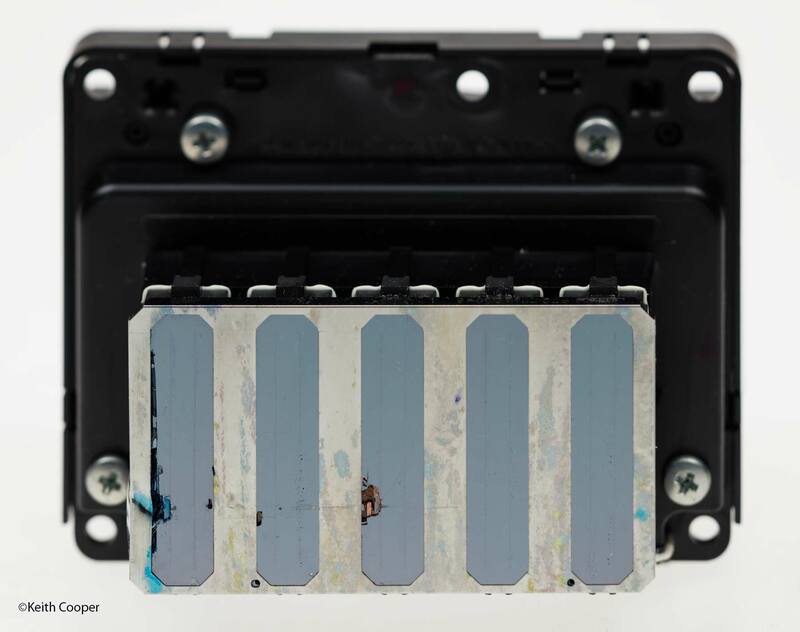 Rather than just waste ink, and suspecting it was more than a simple ink clog I called Epson and they arranged a service engineer to call. 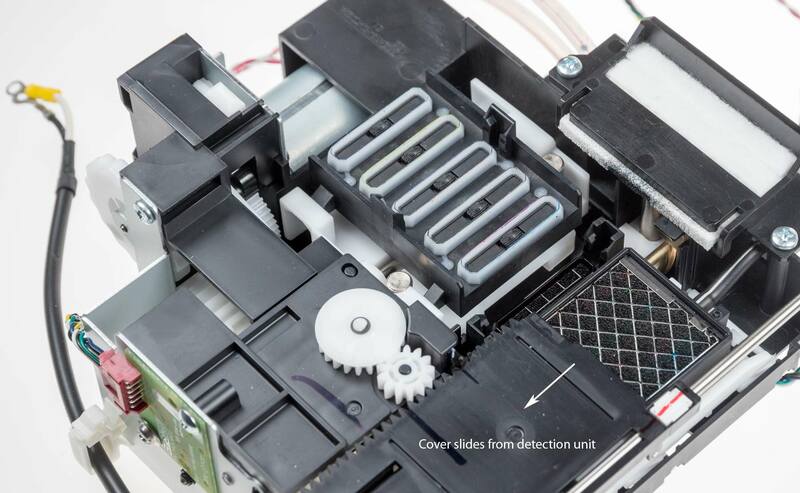 I’ve photographed some of the parts that came out of the printer, both as a warning not to have things that can fall into the printer and for those curious about some of the inside workings of printers like the P5000. We never did find what caused the damage. Maybe a paper clip? 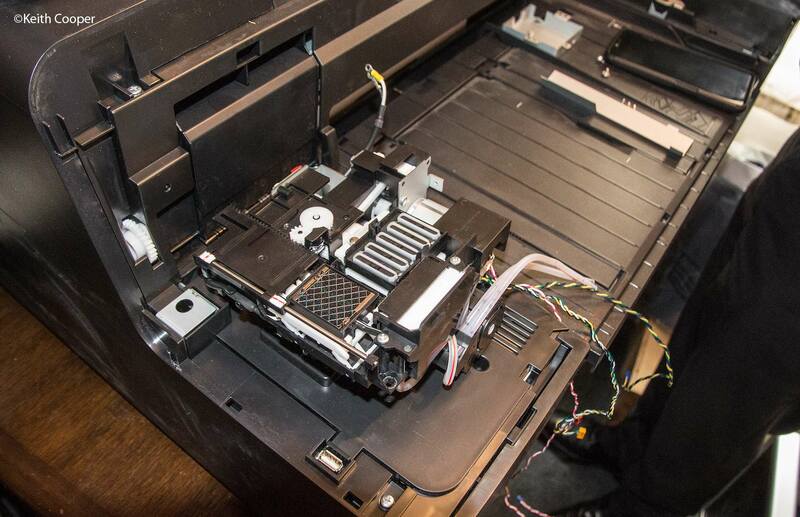 – it probably fell out of the front of the printer when loading paper. My initial P5000 setup out of the box – don’t use the top of the printer for storage! In the UK the best approach is probably to go via their contact info page. I note that they offer fixed price repairs for printers (i.e. all parts included as needed). 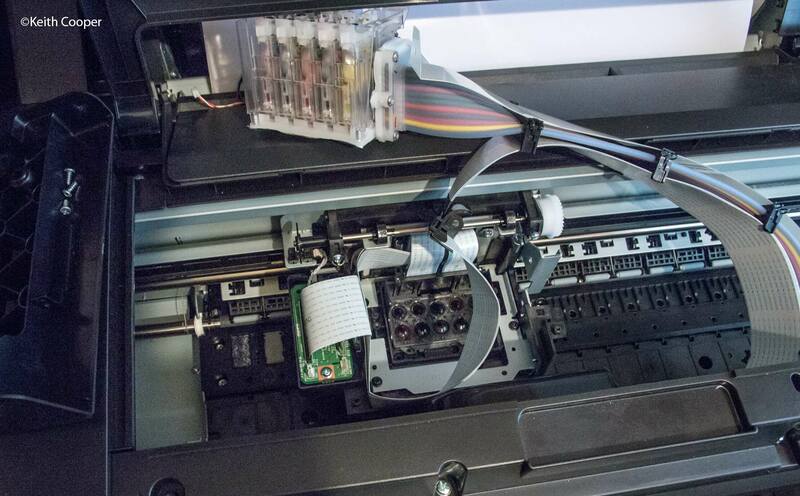 You can extend your warranty (it includes print heads) but remember that warranties don’t include dropping foreign objects into the printer. 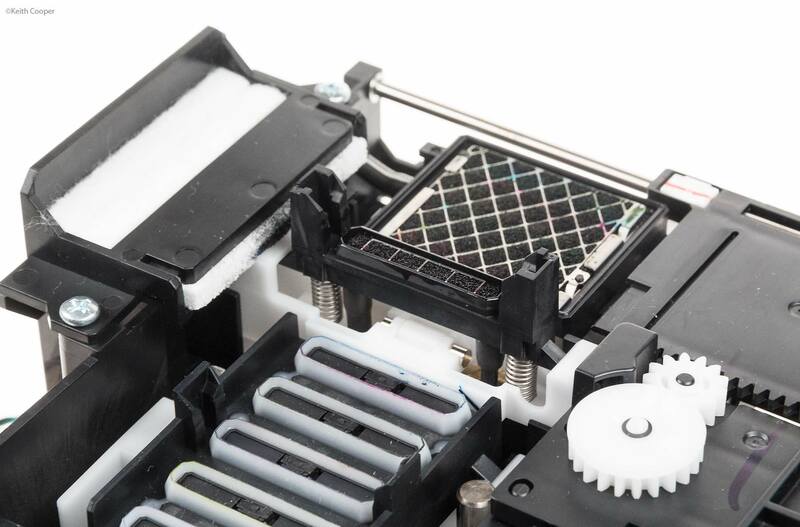 With a damaged print head, the head assembly in the carriage is replaced, but often the capping station is replaced too. For a more heavily used printer, the flexible seals of the capping station (where the print head rests when not in use) may have ‘bedded in’ for the old head and not give such a good seal. It happens that this printer has not been heavily used but it got the full treatment (it will be used for demo and test work eventually). Here’s the damper assembly removed from the carriage to gain access to the print head. 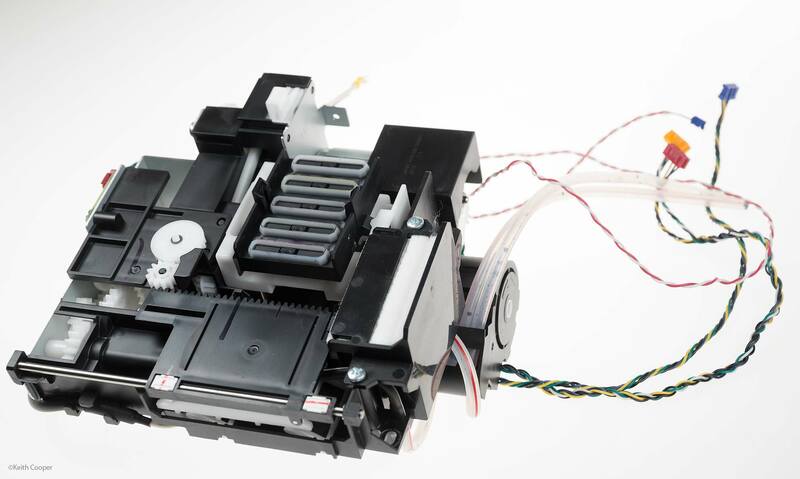 The dampers regulate ink flow from the cartridges to the print head. 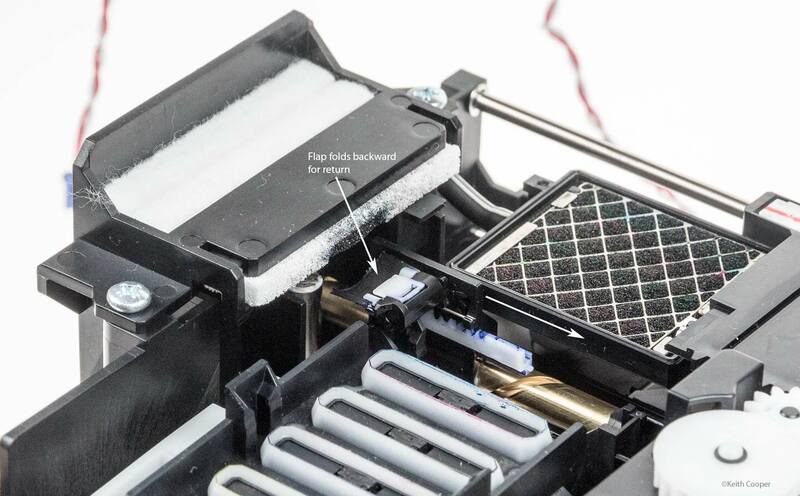 The unit is full of chambers that equalise pressure and give an even feed of ink to the heads as they need it. Removing the head shows distinct dents in areas where there shouldn’t be any. Looking around the printer, we couldn’t find any sign of what caused the head strike. A more detailed photo of the head shows the ceramic structure broken. The little dots are individual nozzles. The head itself is quite simple to replace, -but- you need specialist service software to set it up afterwards. Here’s the capping station removed from the other end of the printer at the back. The capping station has a number of functions. 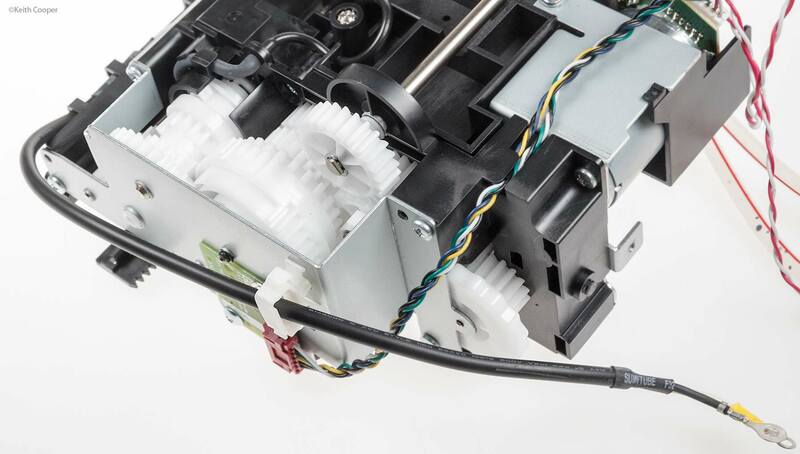 The unit itself is just held in place with a few screws, with electrical connections to the main printer electronics. All the functions come from the actions of just one motor. This drives a large collection of gears (lwr. left above) seen in this view from below. For testing, the entire system can be moved by hand via this ridged wheel. Note the carriage latch is in its up position, this engages a slot in the carriage to lock it in place. 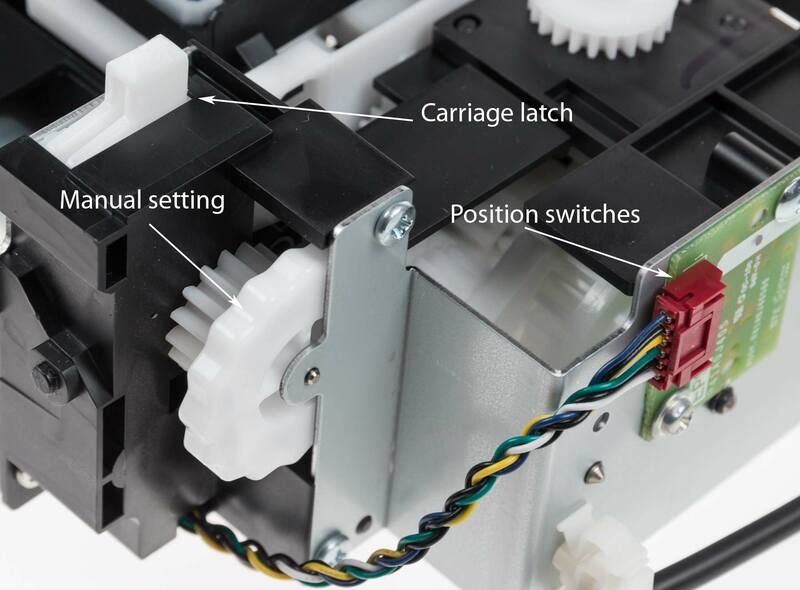 The electronics needs to know where the mechanism is at in its operating cycle, so there are a number of tiny switches on the green board that give feedback on the movement. 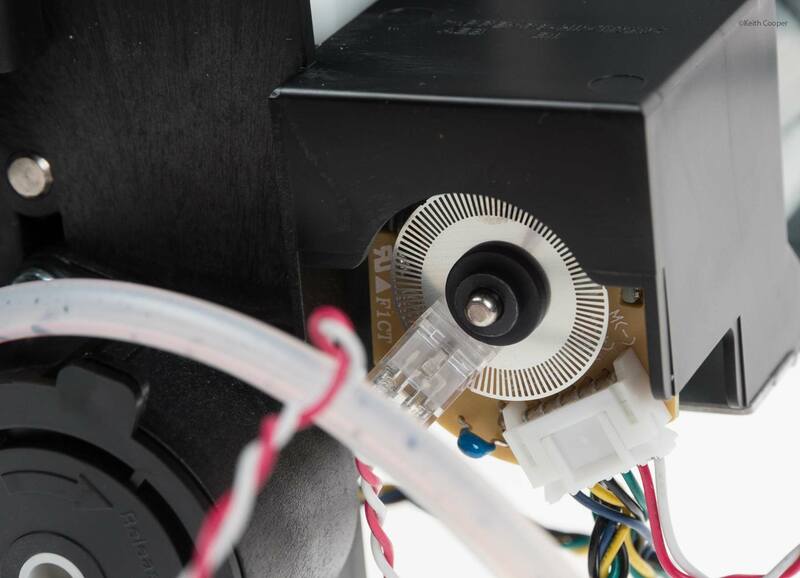 The motor itself also has an optical motion encoder wheel. You can see one of the ink drain pipes in front. 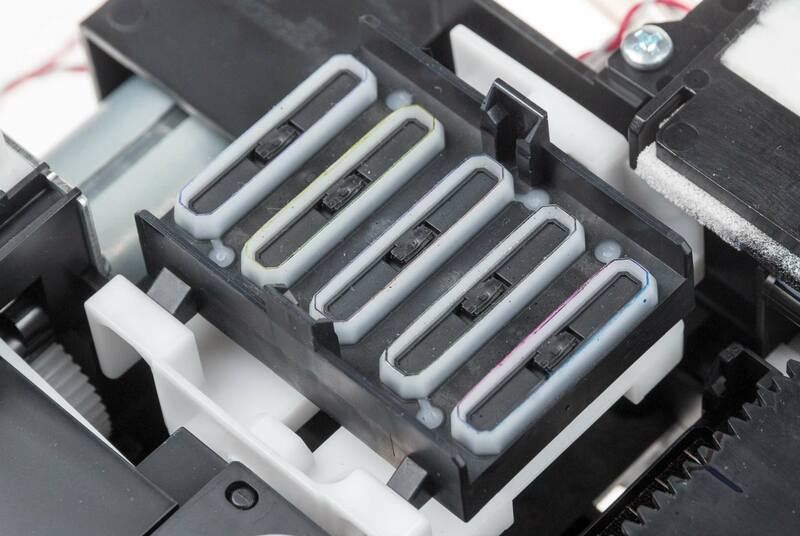 The print head is prevented from drying out by a set of soft rubber strips that rise up to seal each pair of ink channel nozzle sets. 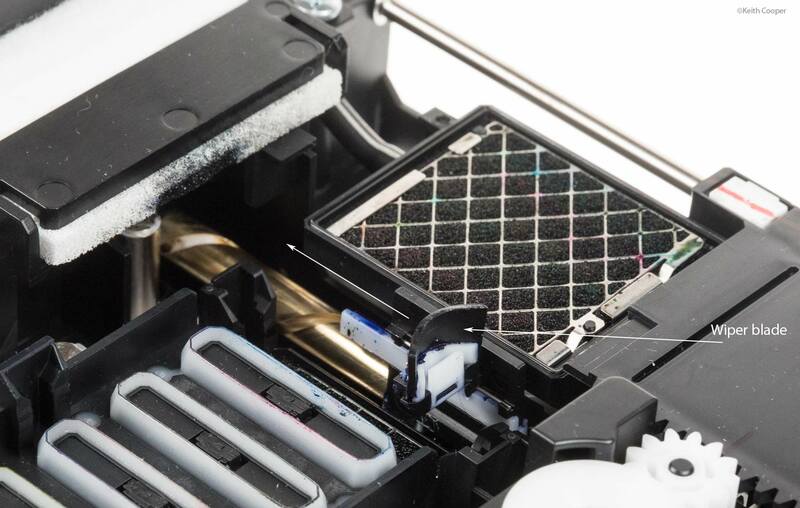 You can access these without dismantling the printer, when the head is clear. There is a special cleaning option in the Administrator section of the printer menu that enables this. (White Cap Clean). During normal cleaning a wiper blade wipes across a channel pair to clean that section of the head. When it gets to the far side, it is wiped on a small pad. The blade then moves a bit further and flips over, so that it does not wipe the head on its return. 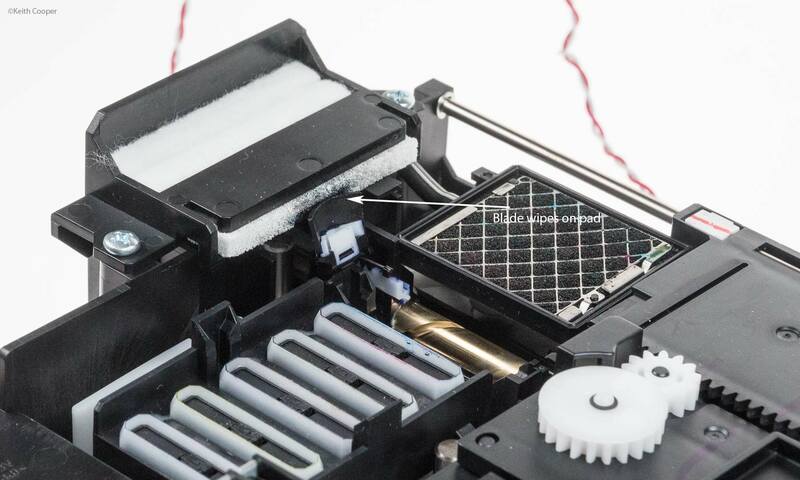 For a deeper clean, ink is drawn through the pair of ink channels being cleaned, via a pad assembly that rises up into position. One other important feature of the P5000 is the ability to check nozzle firing without the traditional nozzle pattern check. This uses the ink detection grid pad. This has a cover that slides over it when not needed. Note the thick wire at the left – this connects the metal grid you can see to the detection circuitry. With the head over the grid, a voltage is applied. 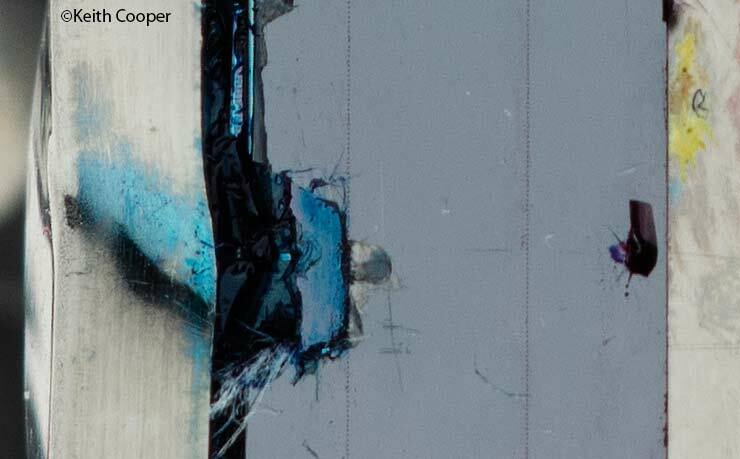 This sets up an electric field that is affected as a droplet of ink is fired from the head to the grid. Tiny fluctuations tell the circuitry that a single nozzle has correctly fired. The head has a QR code that contains calibration data – this needs entering into the printer’s setup memory. After the head is loaded with ink, a number of fine adjustments are required to ensure the head is precisely aligned. These are more advanced versions of the alignment and setup procedures I run through in my Initial set-up and installation of the P5000 article. The one thing I did run again after the repair was the ‘Epson Color Calibration Utility’ (see the installation article). Then I took the opportunity to make sure the firmware was properly updated. 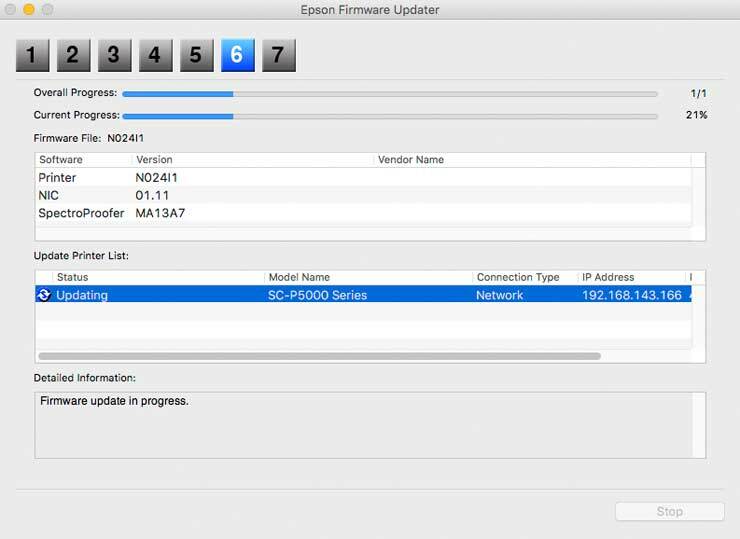 Looking on Epson’s support page it seems it was only recently updated, so I downloaded it and ran the updater.